Dolls from the Attic...Mis Muñecas: What is Papier-Mache? According to the Merriam-Webster Online Dictionary, Papier Mache is a French term meaning "literally, chewed paper; a light strong molding material of wastepaper pulped with glue and other additives." This substance can be placed in molds to create doll heads. 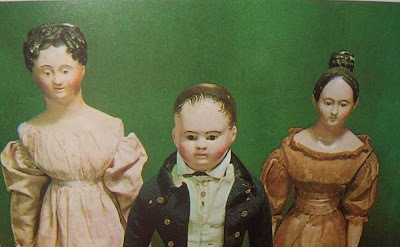 From the earliest creation of papier mache dolls, the masse was pressed into a wooden mold. 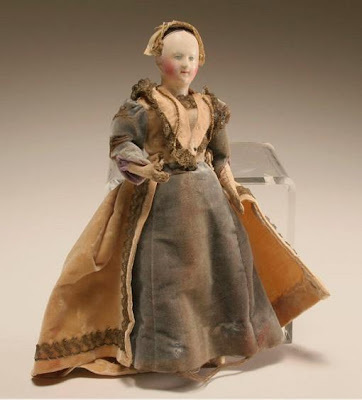 While the molds made the basic shape of the dolls, it was the skill of the bossiere or presser who created the unique doll. Additives to the papier mache made each maker’s recipe unique. These might include linseed oil, varnish, chalk, ground sand, potters clay, resin and soot . One account states that when released from the molds the papier mache heads were smoothed, the two halves joined with glue and then the whole was painted with a mixture of lime wash and ground colours and allowed to dry. The eyes, lips and hair were then painted and a coat of varnish applied. The papier mache heads faithfully reproduced the curls of the current hairstyles, and the finer specimens had coiffed wigs made of mohair or real hair. They had sweeter faces and were more pleasant to handle than the older woodens. The bodies were always stiff, shoes painted and the wooden arms and legs attached to a stuffed torso made of kid or cloth.